Debris from flooding early Sunday morning at Horse Gulch clogged this storm drain and caused flooding in nearby parking lots. 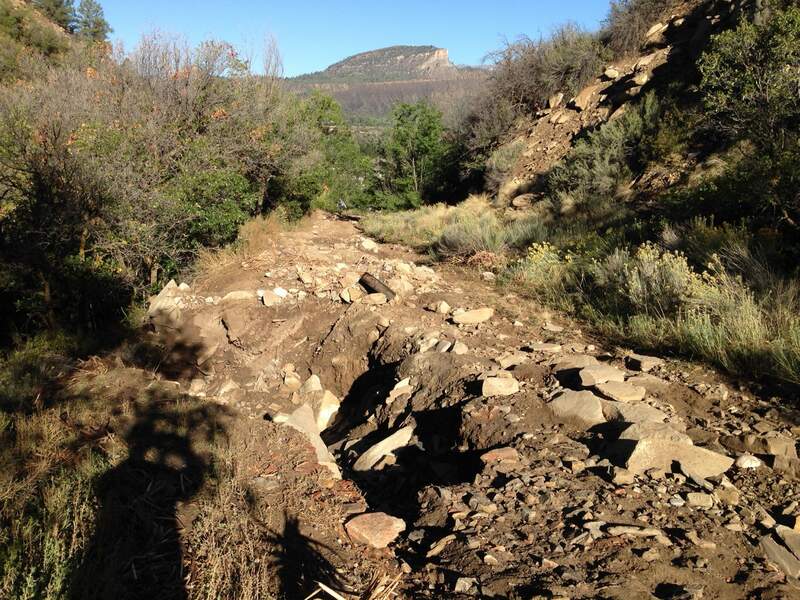 City workers got it cleared Monday, but damage to the road into the Horse Gulch trail system remains. This is just one example of the erosion caused by recent flooding in Horse Gulch. For mountain bikers, the road is unrideable in places. Some locals who hike, run and mountain bike regularly into Horse Gulch have been hoping to make changes to the old road that leads up in less than a mile to The Meadow. But turning that road into a boulder field was not what they had in mind. That, and some serious erosion, is what happened early Sunday morning when a torrential downpour of reportedly as much as 4 inches of rain dropped in the area. The city of Durango worked Monday and Tuesday to clean up the damage at the trailhead, where debris Sunday morning clogged a storm drain, forcing water and mud over a concrete retaining wall and into both the new Horse Gulch trailhead parking area and the new Horse Gulch Medical Campus parking area. 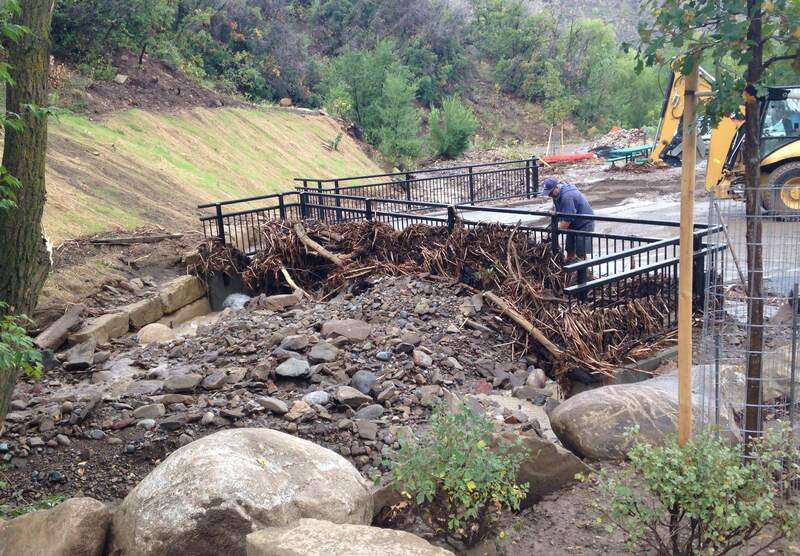 Also, four newly planted trees and some irrigation hoses were ripped out by the torrent, said Cathy Metz, director of Durango Parks and Recreation. Metz is part of a city of Durango/La Plata County effort to assess the damage and come up with a solution to fix it. The county owns the road; the trail system was created by the city. County Road 237, which extends all the way to County Road 234 just south of Edgemont Ranch, is permanently closed to vehicles at its western end, but is occasionally used by emergency vehicles when, for instance, a mountain biker is injured. Metz said Wednesday that the situation is being assessed and the public will be notified when a plan is developed. Trail proponents, led by Trails 2000, are hoping to use this as impetus to create a new and better route to The Meadow, the heart of one of Durango’s showcase trail systems. It was dark when most of the damage apparently occurred, but the gulch overflowed and eroded the road bank in several places. The cascade of water also loosened rocks and debris and rearranged it along a half-mile stretch of the road. What used to be a fairly steep but navigable section is now not much better than a dry, rocky river bed. “I think it could turn into a great opportunity,” said Mary Monroe Brown, Trails 2000’s executive director. The steep, bumpy road has never been representative of the single-track trail system in the Meadow area and doesn’t do justice to the Horse Gulch network, Monroe Brown said. Monroe Brown noted that the Horse Gulch road wasn’t the top priority this week for the city of Durango, which was fixing storm drains and roads from the weekend rains. Also during the rains, the base under the sidewalk next to Goeglein Gulch eroded, leaving parts of the concrete sidewalk hanging in the air. The city closed off the lower part of that walkway and is working on quick and permanent fixes, Metz said.